What IP camera manufacturers have integrators had the worst experiences with? Over the last month, we ran an in depth survey gathering results from over 80 integrators across 19 countries to understand what technologies, approaches and products they preferred. As part of the survey, integrators explained why they preferred what they did. 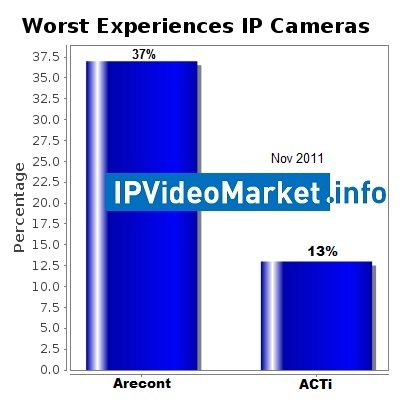 In this report, we share our findings for IP camera worst experiences. Reliability was issue #1 across the board for integrators. Cameras dead on arrival, field failures and flaky firmware were the most common and strongest complaints raised. What makes this so challenging is that there is no easy way to figure out reliability in the surveillance industry. Mean Time Between Failure statistics are non-existent in the surveillance industry and manufacturers guard failure rates more secretly than Fort Knox. Integrators are left to vague marketing claims and trial and error to figure out what works and does not. The responses from integrators in our survey around the world should clearly help shed light on this. While 18 manufacturers received a vote, only 2 of them showed sizable support. Arecont and ACTi combined for 50% of the integrator's worst experiences with the remaining 16 manufacturers fairly evenly split the other 50%. Beyond these two companies, many manufacturers had 1 or 2 negative reviews but no clear trend developed about significant quality or reliability concerns. The only other notable element was integrator disenchantment with Axis's margins / distribution policies - a point which we noted in the IP camera favorites report. Arecont Vision integrator criticism can be categorized into 2 segments - (1) problems with the product's quality and (2) problems with the company. "Arecont has software and hardware issues. We've had issues discovering the cameras once installed. Also they seem to have firmware issues. We've had several cameras lose the IP address or resolution settings once saved." "ArecontVision, we had a lot of problems with firmware bugs." "I installed a large job and found that the Megadome cameras were almost impossible to focus. Also their Dome-5I which was their only solution for an interior dome was clunky and difficult to install. They eventually came out with a focus tool that you put over the lens to compensate for the dome bubble but they still very difficult to properly focus. I find the image quality and lighting performance is poor on their compact line even on a camera at the 1080P level." "We were using the product pretty heavily during the spring and summer they began to have "quality issues". We were getting too many DOAs. Or the cameras became trouble childeren after they were in use for short periods of time." "They have a high failure rate out of the box. They are buggy, the image quality is poor in low light." "High failure rate on the 360 and 180 cameras"
"Where do we start.... horrible product. Horrible support. Purple haze over the picture. High failure rate. Crappy quality (5MP is comparable to IQInvision 2.0MP)"
"The customer and I were excited waiting for the 5MP Arecont camera. The picture and the framerate was awful, we send it back all the shippment." "After a fairly large deployment, several 180 cameras failed in the field. Two replacements sent were DOA. After hearing their explanation of the problem being an isolated instance, other cams began having problems as well." "QC with their domes that I've used seems non-existent"
"Quality isn't good and it's always something strange with cameras." "When they work they work great, but we've had issues such as bad pictures out of the box that required firmware fixes." "Support sometimes condescending or evasive to acknowledge an issue with the camera itself." "DOA percentage. Problem seem to get better with older product but new release products seem to have a high failure rate again." "Defective rate is too high. Any number of examples of cameras installed and faillng 1 or 2 days later, chances of it being defective increase exponentially if camera was higher than 20 feet off the ground, even if bench tested before." "I keep sending them back to the factory. It's not one "what happened" moment - it's a far lagging quality problem." Arecont regularly dismisses quality problems as things of the past. They seemingly do this every year. For example, they did this last year in our 'Arecont's QA and Reliability Concerns' report. Nonetheless, integrators continue to report problems in our survey and in an interesting example a CCTV Forum discussion aptly named "Arecont FAIL" that continues to build over the last year. We continue to uncover problems in their new cameras. We are in the middle of testing their newly released 20MP panoramic camera and have hit issue after issue to the point Exacq has temporarily pulled the model from their supported products list (see our Arecont 20MP discussion for more). "Their management team is difficult to deal with and until recently you had to propose all tech questions through an online process. Very quick to point out that all issues can be fixed via a firmware upgrade." "The manufacturer itself is difficult to work with." "Their support chain is completely bass-ackward"
"The company does not seem to really care." "Their poor product quality and miserable customer service ruined any chance of a long-term relationship with that company. Why put yourself through the heartache of "working" at a relationship when you can just use Axis?" If you look at the reasons why integrators choose Axis to be their favorite, for the exact opposite reasons integrators are calling out Arecont as the worst. A very rare multi-imager panoramic series that provides a cost effective option of deploying multiple multi-megapixel cameras. Plus, Arecont has real hardware engineering expertise and does not simply stick their label on the latest TI reference design. However, Arecont has an achilles heal. They are clearly not demonstrating the same level of dedication to quality control and quality products as their more mature competitors. The failures, the bugs and the arrogance are just the beginning. Their image quality in WDR scenes clearly lags and their night bandwidth consumption is alarmingly high. While Arecont releases products at an amazingly fast rate, the level and likelihood of problems encountered is painful. Obviously, be careful about using Arecont Vision products. We selected them as a risky choice in our IP Camera Buyer's Guide and the strong negative reviews from integrators clearly validates the risk involved. Minimally, you should stay away for a good 6 months from when Arecont first starts shipping a new product. Over and over again our tests on their new products show that what they consider to be 'production' has many obvious issues that have not been fully vetted. Furthermore, if you are buying in any serious quantities, you would be wise to push for advanced replacement of failures. "Seem very cheap, hard to get support and when you do its very bad (was told to wear a glove as the lens was getting hot)"
"Limited support, camera firmware upgrades very difficult, random problems with the streams to my recording server"
"We tested some of their cameras after they came in and gave a demo. We could never replicate the image quality they showed us. I called Tech Support twice speaking to two people who had heavy accents and I could barely understand who were little to no help. An Axis P3301 looked better then their 1.3MP camera. The Rep got angry and just demanded we send the demo cameras back to him." This is offset by ACTi's frequent selection by integrators as a preferred camera of choice for cost conscious buyer's. That noted, saving money on product cost that is offset by increased labor cost and customer dissatisfaction can be very problematic. Like Arecont, be careful about purchasing from ACTi and addressing these problems with them.